Is your child a worrier? 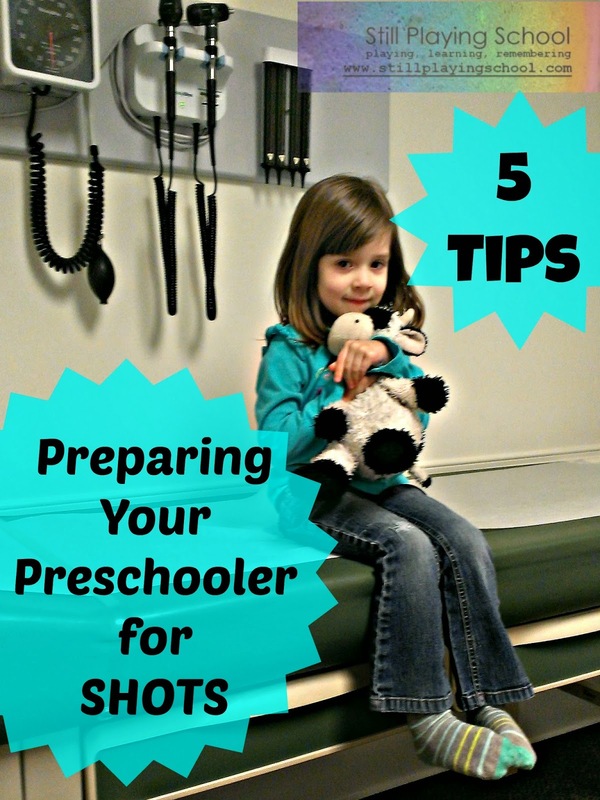 These tips for preparing your preschooler for shots will be helpful if your kid is anxious! E recently had her four year old well child check up. She received the flu shot in October so with that fresh in her mind she was agonizing over her upcoming vaccinations. "I don't want to get shots," she wailed a month before her appointment. She paused as I comforted her then checked, "But I HAVE to?!" I was direct, comforting, and 100% honest even as it broke my heart not to be able to ease her worries. Yes, facing something terrifying yet inevitable is a sure way to bring on stress. I related back to the months leading up to having to face the most difficult challenge of my life. I know it's an extreme comparison, but anxiety is similar. What helped me leading up to facing my biggest fear? How could I transfer some of that comfort now to E? This post contains Amazon affiliate links. If you click through to Amazon from this page and purchase anything, we will get a small profit for referring you! While being honest and direct about the upcoming shots, I continually reminded E that I would be there. I felt it was important that she knew she would not be facing this alone. Together, we could think of ways to make this manageable. I let E bring Cowie, her lovey, to the appointment of course. We also brought one of her new birthday gifts which was a Melissa & Doug Surprize Ink book! It was a wonderful distraction as well as a no mess way to keep busy while we waited. We asked E what she'd like as a reward for being brave at her appointment. She asked to go to the movies with Momma and Daddy. We agreed and took her to see Frozen the day after her appointment (which was something to look forward to for both of us before and during the shots)! I repeatedly reminded her of this treat, she told the nurses, and when they brought in the tray with the syringes, the nurse said, "Let's get you to the movies!" We talked to friends who had their shots already. We watched the Daniel Striped Tiger episode where he gets a shot (and visualizes something he loves). She watched D get his vaccines and me get my flu shot. She knew a lot about the process before we went in! None of this worked as well as my last suggestion for you. As she was worked up and crying before her shots she remembered this option and calmed down immediately as she took advantage of it. We teach our children the power behind their words. We ask them not to say certain words unless they are really upset. At this early preschool age, we tell them when these words are acceptable. We told E when she got her shots she could say hate and stupid. She wasn't talking about a person and she certainly DID hate these stupid shots. I felt her calm in my arms as she carefully whispered, "Shots are stupid. I hate this," through gritted teeth. We were almost done. One injection to go. "That's right," our sweet nurse said, "Let it out, honey." Again, E repeated a bit louder, "I hate shots. This is stupid!" We were done! Band aids, wiped tears, and a trip to the movies awaited us! Do you allow your child to say strong words at difficult times? Great tips! I particularly like that you took her to the movies and let her use "strong words." I think giving those words a context where you can actually say them is really smart - love this! We have just recently encountered words not to say. I really like the way you let her use those! All good ideas!